1. Take down all canvas. Reduce windage and potential damage. This includes biminis and dodgers. Take down roller furled jibs, take down the main sail. Yes it’s a lot of work, but those with canvas up fared far worse than those without. Put out all the fenders you’ve got, and then some. 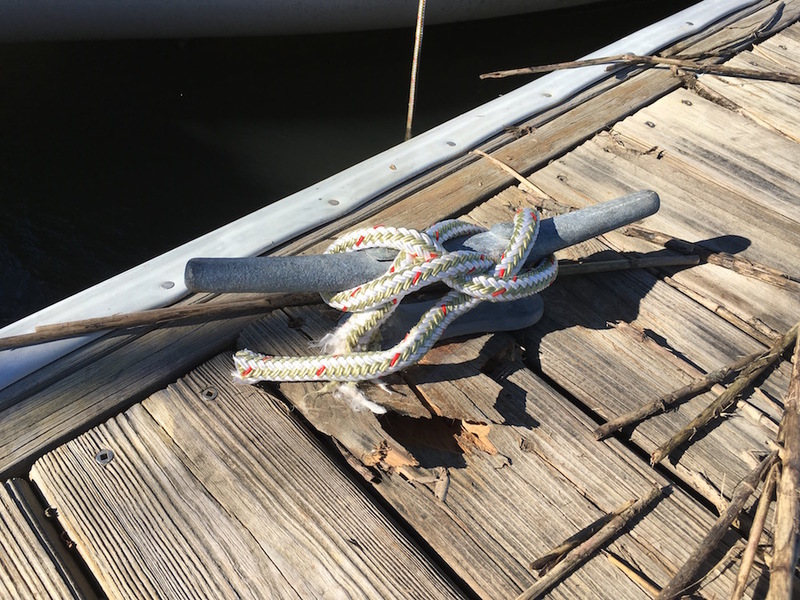 Tie them to both sides of the boat, at the stern or bow too, whatever is facing the dock. Tie them to the toe rail or the base of the stanchions, not the lifelines. 3. Don’t use old dock lines. Sun weakens the fibers in dock lines over time and they will break. Double all lines, and tie in all directions. Tie them across the dock if possible, as longer lines have more stretch and will jerk the boat less. Double your spring lines and make sure spring lines won’t allow the boat to go too far into the slip. Give the bow, or the stern, plenty of room – like three feet. This is a just in case move. If you’re near the seaward end of the dock, an anchor well out into open water may help. Ours served as a major added bow line, saving our boat from breaking free. Should the docks go, your boat has a better chance of staying in place. We accidentally left ours unlatched and it blew open and let some rain in. We saw several boats with hatches ripped open. Use duct tape or Gorilla Tape to fasten the hatch frame to the deck. Also helps keep blowing rain from getting through the hatch seal. 8. Make sure your bilge pump works. And make it as high capacity as possible. Check the boats around you, help with their lines and fenders. Help less experienced sailors secure their vessels. Far better to risk a hurt feeling than to risk breaking a marina. Check the docks, lines, fenders – often. All differences go by the wayside when a hurricane strikes. We lucked out with a group that was skilled, friendly, funny, sharing, accommodating and helpful. Everyone contributed what they could and it all meshed beautifully. 12. Have great luck, and be happy for it. This is one boater’s advice based on one experience, of one hurricane. I’m sure not everyone will agree on all of these ideas, so discussion and critique are welcome. Do you have a different set of prep steps to share? Please share your hurricane prep and experiences in the comments.